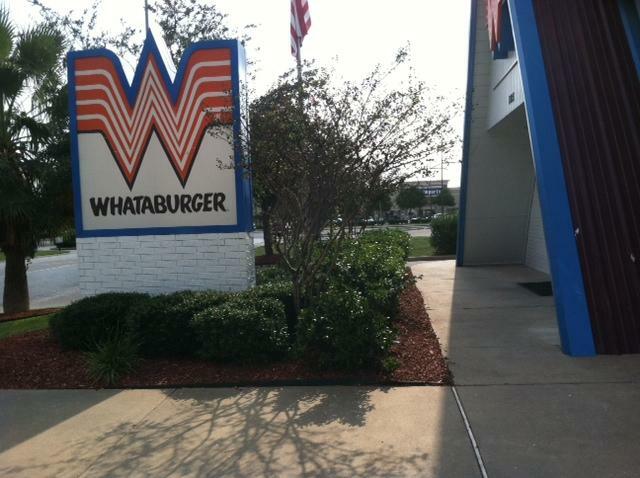 This was taken sometime in January of this year, when I did the Whataburger re-post. The history behind the Gumby's pizza chain is murky, the website for the chain gives no clue of its founding and I can only guess it was licensed from the decades-old children's TV show many years ago and allowed to fester and grow into its own identity to present a pizza chain more common for the college crowd. Even in the 1980s, there was a pizza known as the "Gumby Dammit". The website also features classic Gumby videos, which are bizarre in their own right, and almost feels like something they'd show on Adult Swim, as it gets even weirder when you're sleep deprived or otherwise under the influence. It's the pizza chain that's very rare (less than a dozen locations, all near colleges). It's the one where you can get a pizza delivered at 1:15 in the morning (they stop at 2) and sells pizzas like the Stoner Pie, which includes mozzarella sticks, french fries, pepperoni, and sausage. It's also a place that can get away with having a non-lit sign and choosing instead to string Christmas lights around the non-functional signage. I've eaten at Gumby's a few times and it's, well, it's not very good and if I was in the area (which I was a few years ago) I would probably go to DoubleDave's. 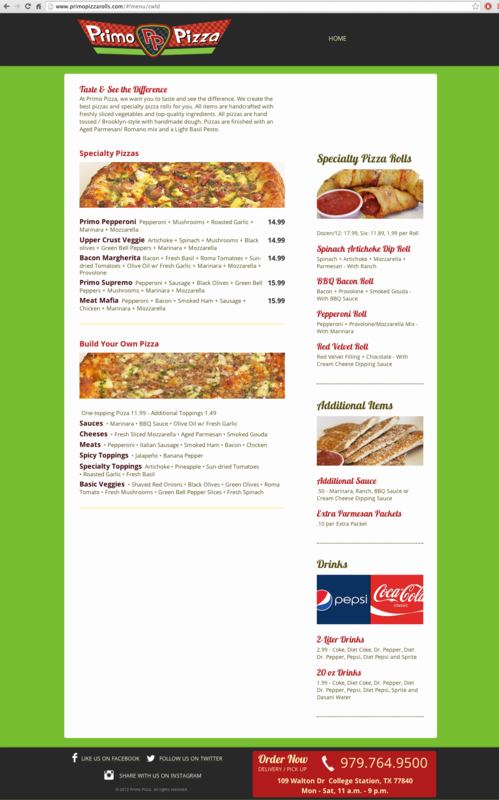 The drama around Gumby's got interesting a few years back when they opened up a location in Wellborn called Black Sheep Pizza, which featured a different logo but still the same menu (and presumably the same recipe). The way I understand it is Gumby's was sold among different partners, and Black Sheep Pizza (renamed GranDandy's Pizza & Meals after a trademark dispute) spun off completely, with a clause that Gumby's could buy them back, which they did after GranDandy's became a moderate success, leading the owner to build Howdy's Pizza (still in the works) with the modified recipes and menu. EDIT 2/24/19: In October 2018, Gumby's moved to the former Wolfies location at Post Oak Square so that Whataburger could expand and rebuild. 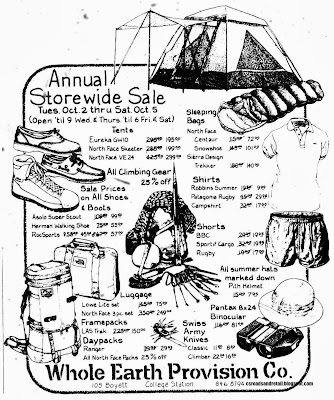 Originally I was going to rewrite my old Eastgate page, but then I figured I could easily rewrite it into several posts, not to mention it was several years since I did anything with it. 109 Walton, from my records, seems to have been food related for most of its life. "Wing Zone" was here in the early part of the 2000s, records indicate, and during the 1990s it was home to Partners Food Delivery. My personal experiences deal with the current tenant and the two before it. First, there was Leaning Tower Pizza, which if I recall was here since the mid-2000s. It was an interesting place, with a particularly greasy pie with a unique cheese pizza. It was also very grimy for a College Station restaurant, but I didn't mind because that's why you have pizza...hot enough to kill any dubious bacteria. It had some garden furniture for an "eat-in" area and had "free delivery" that had a significant discount if you picked it up in store, which means it wasn't actually free at all. While an Eastgate pizza place was no more than a memory, it did have one more tenant afterwards that opened by fall. 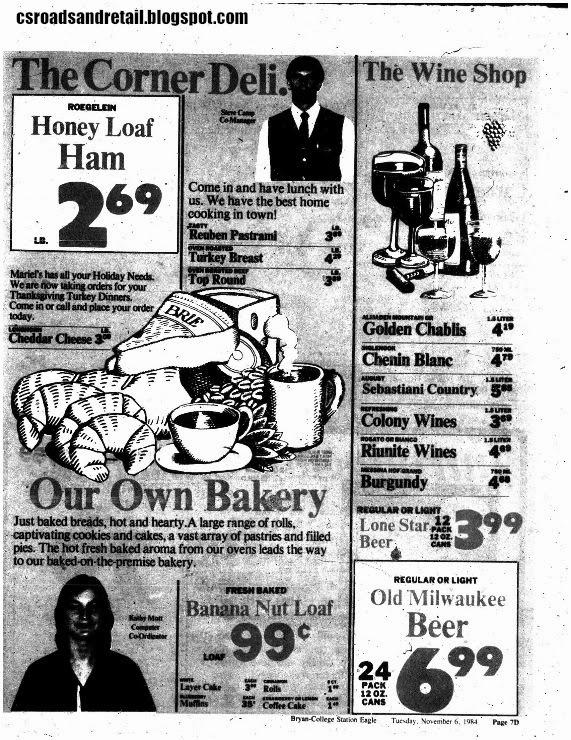 This is still open today...My Daily Bread Bakery. This was one of my favorite places in my neighborhood when I lived on Eastgate, cinnamon rolls for breakfast if I was running late for school, decent coffee and espresso, and even (though I don't know about it today), a selection of used video games (from her husband) for sale, where I bought Pikmin and I believe Metroid Prime. I haven't made much progress in either, or you would see it in Carbon-izer GAMES, my "game review" page. Here are a few other pictures that I took in May 2014 after the restaurant was gutted. • Gutted PP, May 2014. This is where the counter and menu were. The kitchen was behind that wall. This configuration was intact for both LTP and PP&R. The Exxon at the corner of FM 1179 and Boonville, which I have only recently seen, as shown here in a picture I took this February. 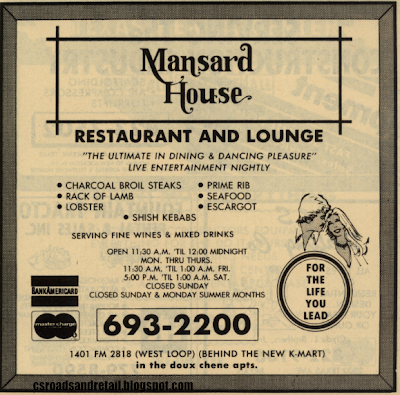 It has been open since at least the mid-1990s and has had several restaurants in it (a bit unusual for something not off of a major thoroughfare), since it has a kitchen and an eat-in area. "Fratello's Pizza Company" is the only one I've found at this address (3200 Boonville Rd) but they also have their location as at the old Daylight Donuts space a bit west of here. In late 2007, it became the home of Stover Boys, a hamburger-and-fries outlet that kind of had a "rural outlet, specials written on a chalkboard" feel to it that opened to much local acclaim. 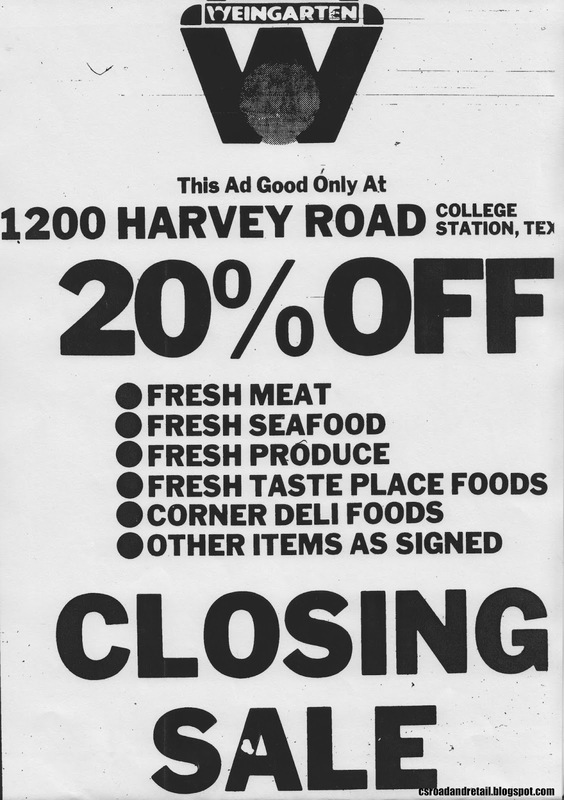 It was where Bryan-College Station was acquainted with Charles Stover and his restaurants. Stover's restaurant was an instant success, and people would come out to this little gas station and fill up every available parking space. 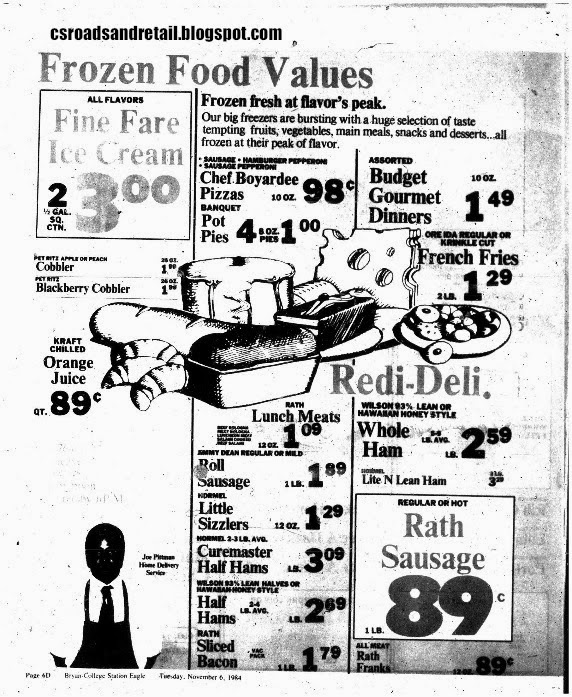 When it turned out that people would pass it by rather than fight for parking, it was clear that Stover's had outgrown itself and Stover Boys moved into an old restaurant pad in Westgate Shopping Center, clear on the other side of town. This was in 2008, and although it opened around early 2009, the Stover Boys signage still hangs at this Exxon, which also suggests how rarely new restaurants come in. If you've paid attention to our Facebook page, I updated a number of other articles, which are listed there. Despite looking bad, this is about the extent of it. This building, built in 1963, has seen a lot, including the after-effects of a fire in June 2014, which despite looking worse for the wear, was only quite limited to what to you see here, with Lippman's opening the next day and Jin's the following week. Lippman's side (112 Nagle) opened as Lippman Music in 1994 (guitars and such, not albums) after moving from Culpepper Plaza (where it opened in the 1980s) but according to Brian Lippman served as a bus station in the distant past (the double doors that don't open was a freight entrance). 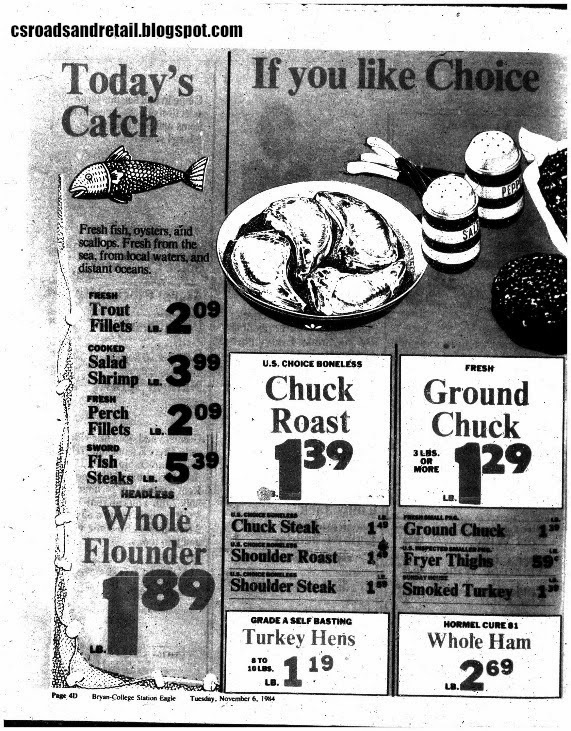 Prior to 1994 it was the original location of Notes-N-Quotes before it moved to the old Exxon. UPDATE FOR 2019: In May 2017 Lippman Music closed permanently when Brian Lippman retired, with Jin's closing soon after. The building was repainted (but not otherwise touched), and by mid-2018 two new tenants were operating, BonAppeTea (112) and Nam Cafe (110). To help account for these changes, the post has also been renamed. Reading this post brings back a lot of memories for me, namely fall 2014 when Torchy's opened and I was living in Eastgate at the time. When I first wrote this post back in January 2014, this post was not on Torchy's (at that point, it being a Torchy's was a rumor), but rather the recently-closed Sully's Sports Bar & Grill, which was the rebranded Fowl Digits. The post URL (Something Fowl at 1037 Texas Avenue) and comments refer to this. 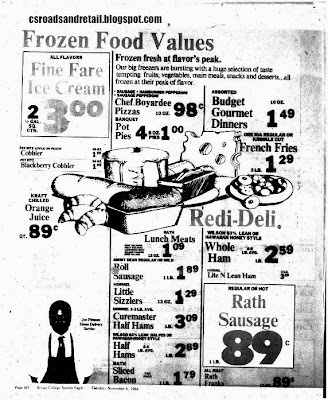 At the time it was considered a "cursed" location for all the restaurants that had struggled there over the years, and at the time, Eastgate wasn't doing so hot either: there was no nightlife and pretty much your choices were Layne's as far as eating went. Later on, I updated the post around September. This is why the picture on the top of the post is still early evening and no crowds, at that point, Torchy's had put up all signage but not yet open. After it opened (and yes, I did attend the public pre-opening party, and enjoyed free tacos and alcohol), it was pretty much impossible to take a daytime picture without crowds and cars blocking it. The building itself is interesting and dates back decades, long before Fowl Digits and the parade of restaurants that followed. Here's a bit from The Eagle from its 1962 groundbreaking as Coach Norton's Pancake House, the first restaurant in the spot. Coach Homer Norton, coach of the 1939 Texas Aggie national football champions, and his wife expect to break ground Monday or Tuesday for a $200,000 restaurant on Highway 6 in College Station. Norton, 56, was in the city Wednesday and today, making final arrangements for the ground breaking of the establishment to be known as "Coach Norton’s Pancake House." 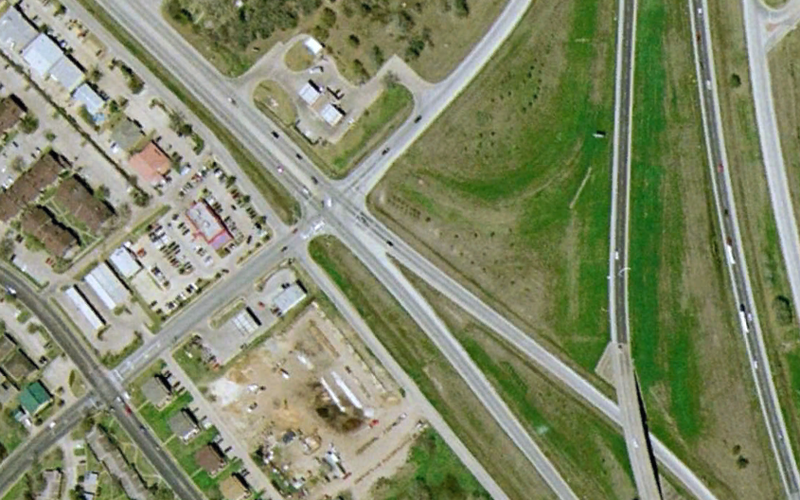 The approximately 200 - capacity edifice will be constructed on the corner of Highway 6 and Kyle Street in College Station. The former Aggie coach has a similar business in Rosenberg—-gathering place for members of the ’39 champs when A&M is playing football in Houston. Norton officially announced the new B-CS restaurant, which is to be completed in about four months, today. R. B. Butler is general contractor for the restaurant. "I’ve been looking forward to this for a long time," Norton stated. "Actually I feel like I’m coming home. We have many close, dear friends in College Station, Bryan and throughout the state. So many of them travel in and out of College Station it’s going be a great chance to visit. Actually I dreamed of this long before I quit coaching,” the white-haired Aggie mentor said. 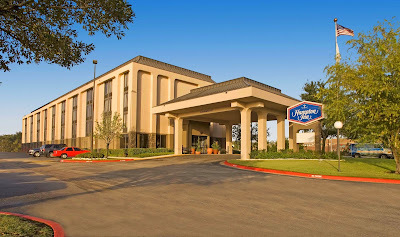 “I always wanted to do two things; own a motel and a real high class eating place.” After a 14-year tenure as head coach at A&M, Norton resigned the post in 1947 and opened his motel business in Rosenberg, "This place will be my big prize," he added, "and I imagine it will be the largest and finest of its kind between Dallas and Houston." The 200-seat restaurant will feature 25 varieties of Norton’s nationally famous pancakes as well as steak, shrimp, chicken and other foods. Completely carpeted throughout, the pancake house will provide the finest of kitchen equipment and fixtures, according to Norton, with all-around parking and an eight-foot covered walkway on the sides and front. Norton indicated a manager would be in charge of the establishment, as in Rosenberg, and that he would commute from Rosenberg. Coach Norton stated he would probably spend most of his time in College Station, however. The building was to be lined off today and set on the lot for construction to get under way immediately. 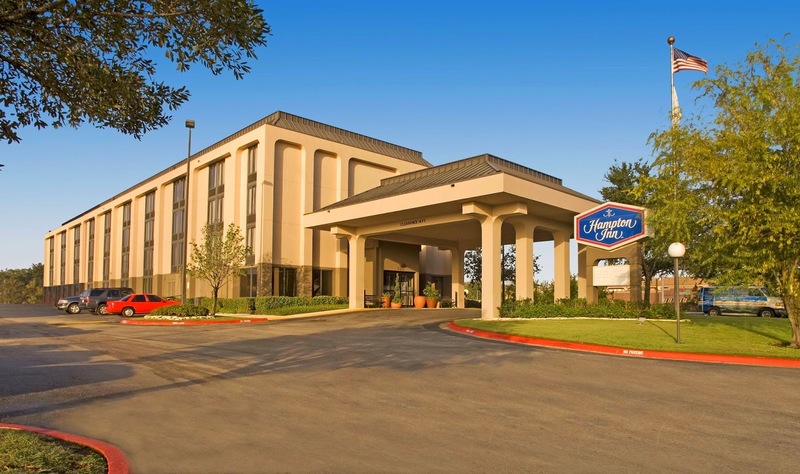 Sadly, Norton would not see his new restaurant for very long, as Homer Norton would pass away in 1965, but his legacy still stood (the motel in Rosenberg still exists as the Homer Norton Motel, though its existence is in question today). The Pancake House in College Station continued for a years afterward but closed in 1970 (by references we have now), but the building stood and changed hands many times. 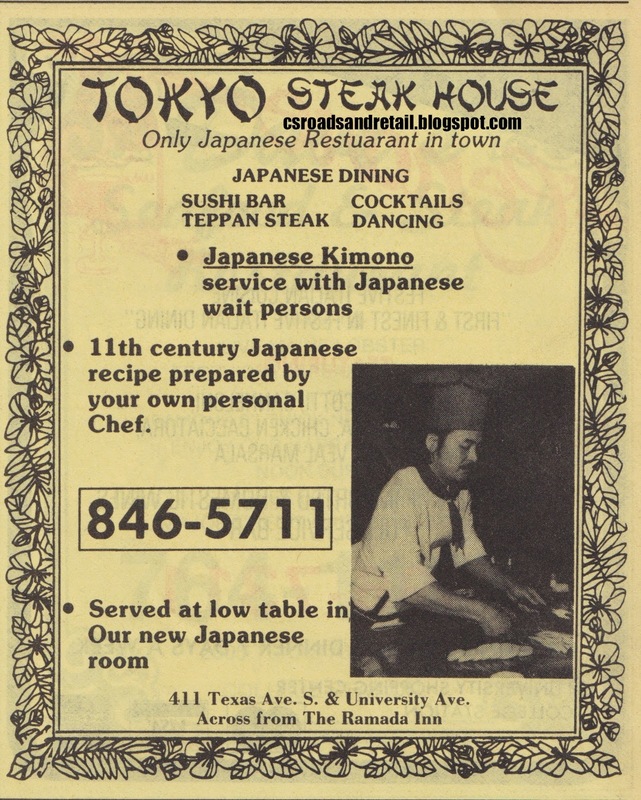 One of the first restaurants to reoccupy was Fontana's Italian-Mexican Restaurant. This actually had no relation to the Fontana's that would later occupy it. 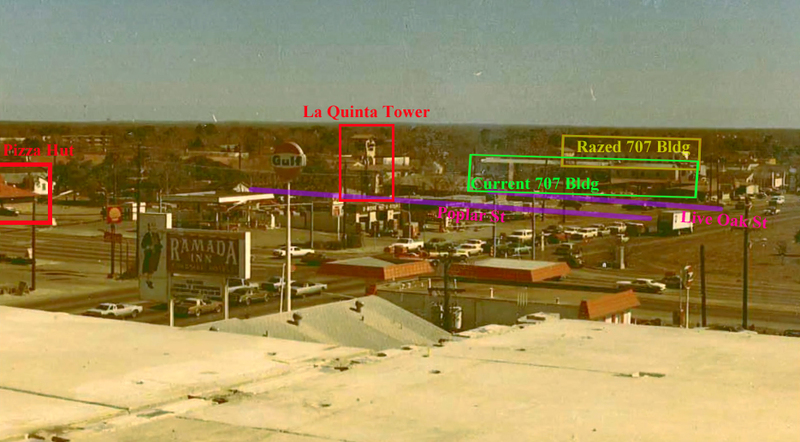 The first reference to Fontana's appeared in 1970, not long at all after the demise of the Pancake House. 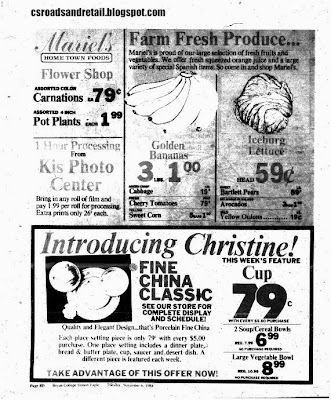 Like the later incarnation, Fontana's would specialize primarily in Italian and newspaper references to Fontana's would continue into the late 1970s. As time went on, the space saw many eateries come and go in a relatively short timespan, earning it a reputation of a "cursed location", intensifying the intrigue of what would be a lowly building that long would've met the bulldozers years ago. The next location to occupy was Mama's Pizza. 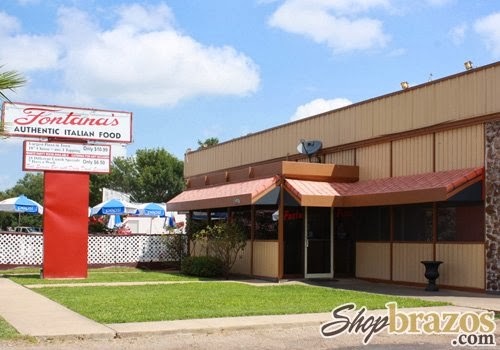 Mama's relocated from 807 Texas Avenue South, by 1986, Pinon's Restaurant (possibly actually Piñon's) was in the old spot and Mama's had taken over at the Pancake House location. Their old location was the old Oakridge Steakhouse (leading to confusion like how Oakridge Steakhouse was at this location). At that location, Mama's even gave out little paper moustaches to promote their restaurant. 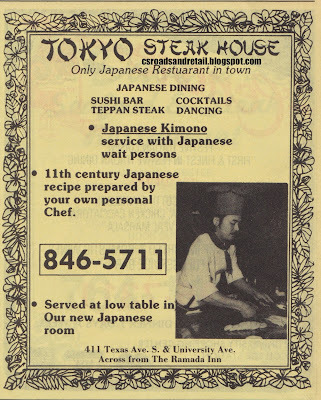 A 1993 directory (but not a 1993 phone book) lists "Shanghai Chinese Restaurant" as well as a 1996 directory, however, TexAgs claims that it was open for a "week or two", which seems to be a gross exaggeration. It's plausible that Porky's Hamburgers, another spot, was actually open for "six weeks" (after all, Front Porch Grill didn't last a long time either). Additionally, Rockyano's Pizza was there as well, according to the thread. 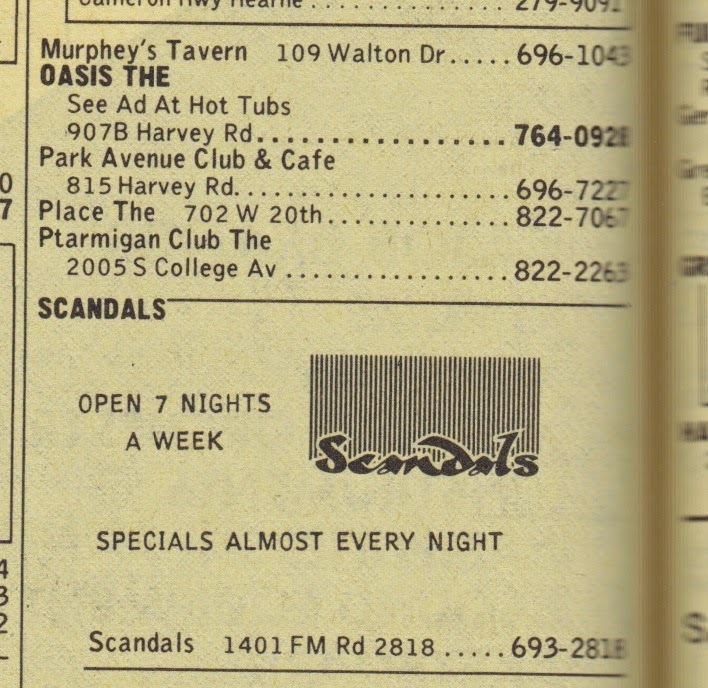 Either way, a 1996 phone book lists "Shen Zhen Chinese Restaurant" (sushi restaurant mentioned in TexAgs, maybe? 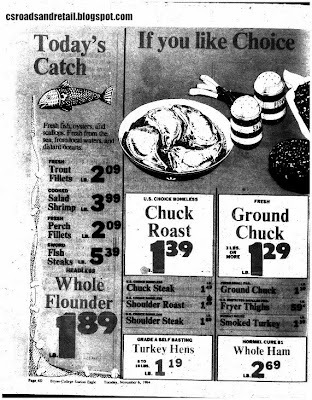 ), and in February 1997, Snuffer's opened as per ribbon cutting information from the Chamber of Commerce. 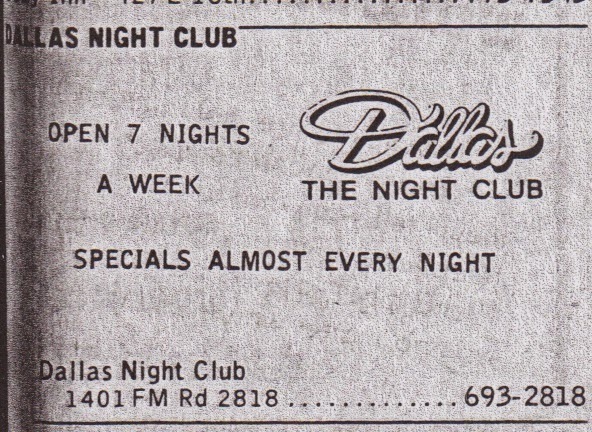 This is also a point of contention of when it existed: the College Station location was apparently closed in October 1997 due to the widening of Texas Avenue (you could say that the restaurant was "snuffed out" by the construction), but the date was wrong (widening was in 1998, and multiple other sources back Snuffers being in '98, not '97). 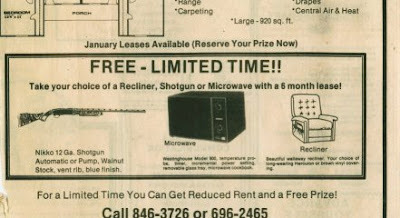 It's possible that 1997 was correct but I wasn't around for the spectacle. After Snuffer's was El Arroyo (late 1990s/early 2000s), and then later Cazadores Mexican Restaurant (may have skipped another restaurant in there), and finally Fontana's Authentic Italian Food from 2009 to 2011. Note that this is a time when the sign wasn't triangular: this can be seen here. It's unknown why they changed the sign, but Fowl Digits restored it to its original 1960s appearance. 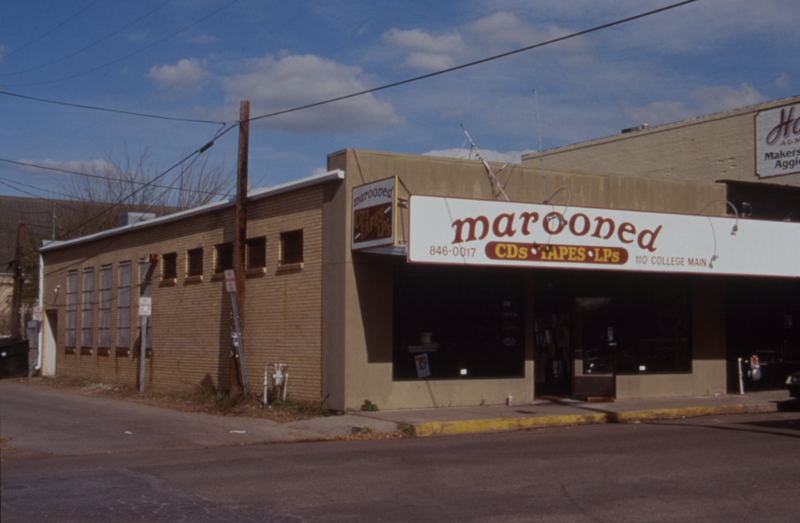 In late 2011, some new owners bought the building and gave it a substantial remodeling, adding a semi-covered patio and making it appear like a modern building (with stucco) and less like a 1960s building with new paint. Fowl Digits opened in early 2012 (50 years since Coach Norton started out), but despite some flashy advertising, it had a number of problems from the beginning. The name wasn't especially attractive, as it's easy to aim for "quirky" and hit "turn-off". The second problem was that it tried to go for the wrong market. At the very beginning, they were promoting the line of their restaurant, Raising Cane's, and Layne's as "Chicken Strip Row", but Fowl Digits wasn't aiming for the $6 meal of chicken fingers, Texas Toast, and fries: they were a sports bar (indeed, a drink coozie I have states that it's a "sports bar disguised as a chicken finger place") and had prices to match. It also had a bunch of TVs (literally dozens). The portion sizes weren't working out, either. I felt rather unhappy and still pretty hungry after spending $6 (that's without a drink, at the time $6.50 for a full meal was standard) for the "Chicken and Wawfuls", which was just that. No sides or anything save for some syrup. After a few months (by October), the owners of Fowl Digits decided that the "disguised restaurant" wasn't working and rebranded themselves as Sully's Sports Grill & Bar. That seemed to do better for them (even if the name switch seemed pretty desperate) as the menu expanded to add things like hamburgers. It still wasn't enough to gain a following (and reviews were mixed), and the slightly awkward location has caused the restaurant to not reopen after December 2013, living up to the "restaurant curse" label, which is a bit of a shame since the owners of Fowl Digits/Sully's seemed like nice people, not like the owner of Dragon One in Bryan. As for why Sully's closed, I don't think it was the location at all, just a manner of confused marketing. The initial attempt was trying to pretend they were competition to Layne's and Raising Cane's when they really weren't, then when that failed, they switched to a fairly generic "sports bar" type joint with overpriced bar food and a bunch of TVs. 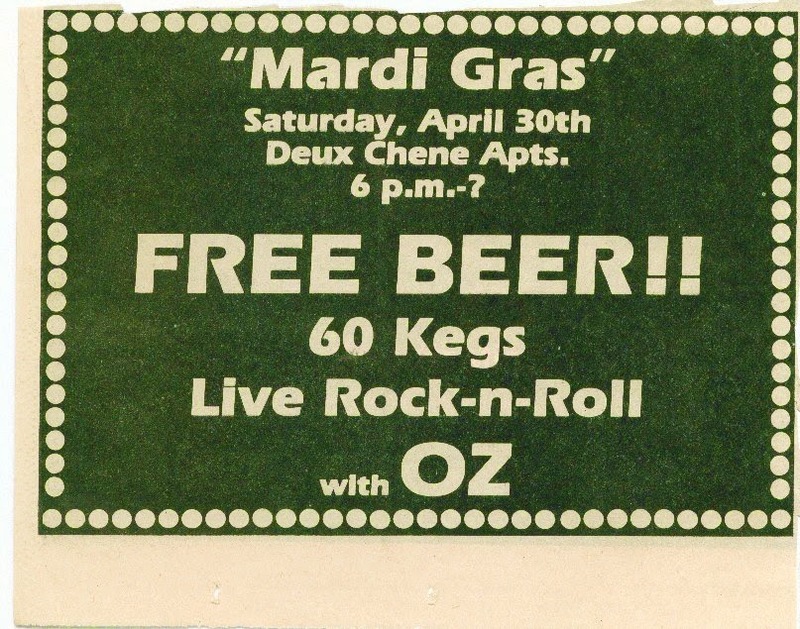 There weren't any pool tables and they couldn't even have glass glasses for beer. Any nonsense you heard on MyBCS like "People don't like $8-9 meals" is only partially true--$8-9 for a small plate of mediocre food won't cut it anywhere. After the rumor of Torchy's was confirmed in early 2014, in summer, the demolition of Sully's commenced. It wasn't a total demolition (nor was it the "everything but a few walls" demolition that happened to the Deluxe Diner or Egg Roll House) but did strip off nearly every element that the Fowl Digits/Sully's owners added on, including exposing the Fontana metal siding before replacing that too. 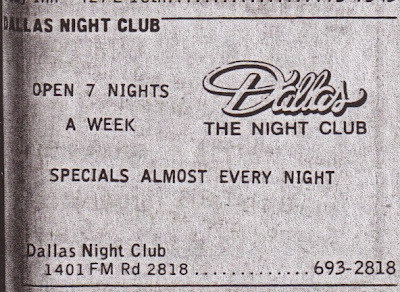 It also dismantled the 1960s era triangular sign for the purposes of more outdoor seating, instead opting to have a large sign facing Texas Avenue with a huge colorful neon sign with the "baby devil" logo. 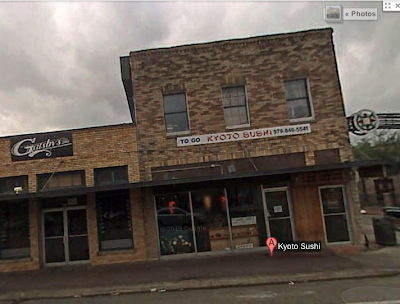 Here are a few more pictures I got of the building, in both its post-Sully's days and pre-Torchy's Tacos days. • The Fowl Digits/Sully's patio shortly after it closed in late 2013. • Torchy's September 2014. Almost the exact same view of the Sully's side view above. Compare and contrast! • A closer look at the red and white. These are road reflectors! It opened October 16th but I got into the building early and took a few pictures of the soda fountain and menu, though oddly the menu boards were replaced before opening. Feel free to leave comments. Updated September 2014 with new title, photos, and substantial information. Updated July 2015 with further integration, and finally some updates in August 2016 to officially add to new list. This post will show some of the businesses of Boyett Road in detail, except, of course, the Blackwater Draw Brewing Company. The problem is that because of the way that tenants absorb each other and the spotty nature of the city directory, it's been exceedingly difficult to figure out what actually went where. It's been difficult to find out buildings about this strip simply because they change addresses. For example, there was a Marine recruiters at 105 Boyett in the mid-1990s (likely absorbed into O'Bannon's), and even until the late 2000s there was "Pinky's New School Tattoos" at 113 Boyett. Here a few more ads for your viewing pleasure. 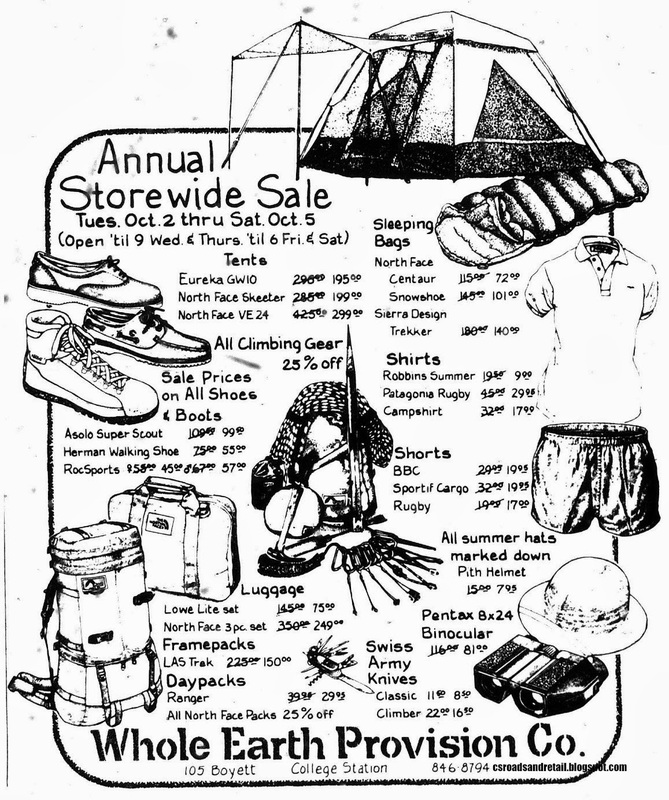 One of the countercultural "back to nature" stores inspired by the late Whole Earth Catalog, this ad is from 1985 and is still around in Houston, Austin, and other major cities...just not in BCS. Almost a decade earlier, you could get a motorcycle there (University Cycling). Such a way to respect the elderly. Tact, it's useful! 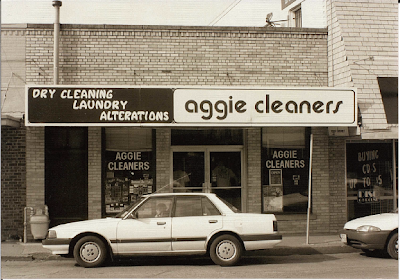 At 109 Boyett, there was a small café here in the 1980s. Doesn't sound like a bad place, but I like eating outside when the weather's nice, which sadly doesn't happen very often. Gizmo's Cafe & Bar: it's from an old copy of InSite Magazine, this is now the site of Paddock Lane. Gizmo's was not the first tenant here, but it's what I have information for. Above Paddock Lane and Tipsy Turtle is some 1-bedroom apartments, located at 214 Patricia. By no means is the list complete! If I missed anything ("Ozone", "Vertigo" being among the not-here), please mention it in the comments! This is going to be one of those posts that have gotten many, many rewrites (see University Square or the one involving Fish Richard's), but I had originally started this back in August 2013 and never got around to it because of burnout (at the time I was doing something nearly every day), then I finally finished it up in December, with seemingly conclusive research that the supermarket there was not Weingarten as I had read on one of my websites but rather a supermarket called Mariel's. Turns out I was right, and yet so wrong. 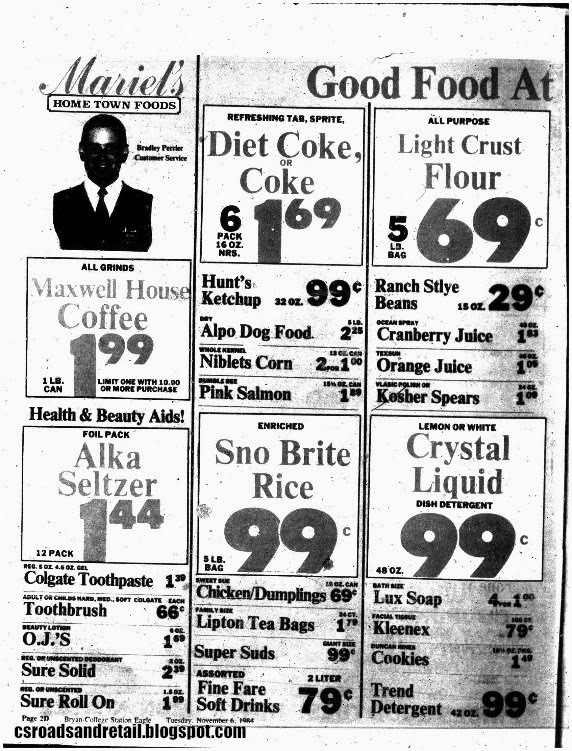 The reason why Weingarten in College Station isn't well remembered is because it ended up being the shortest-lived supermarket in the area, existing from November 1983 to January 1984. 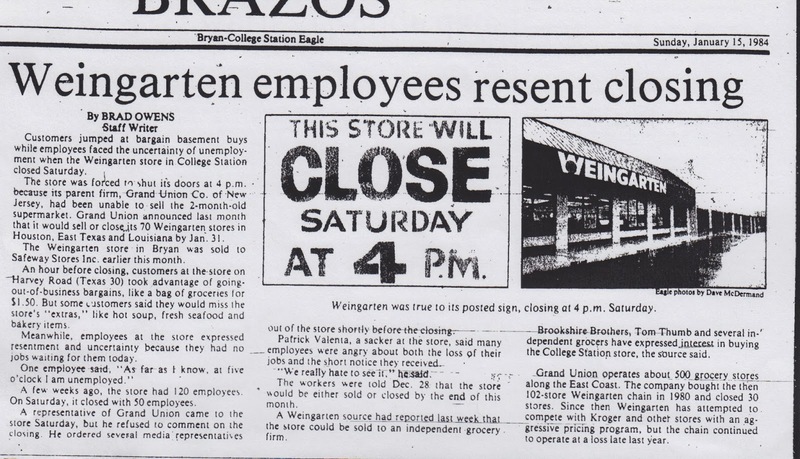 On the other hand, Weingarten in Bryan lasted around 30 years. The intrigue I've had with this building goes back some time, as according to the HAIF's DrFood, "Weingarten's in College Station in the shopping center next to Post Oak Mall. The store was very upscale when it opened. They had gourmet food like Central Market does, a coffee bar, and a huge candy/nut bar. They had a bakery that today would rival Central Markets. 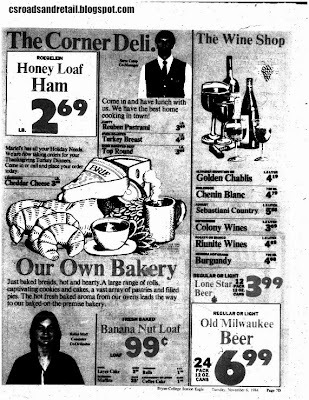 Being a Weingarten's they had the only Kosher section in the [greater area]. 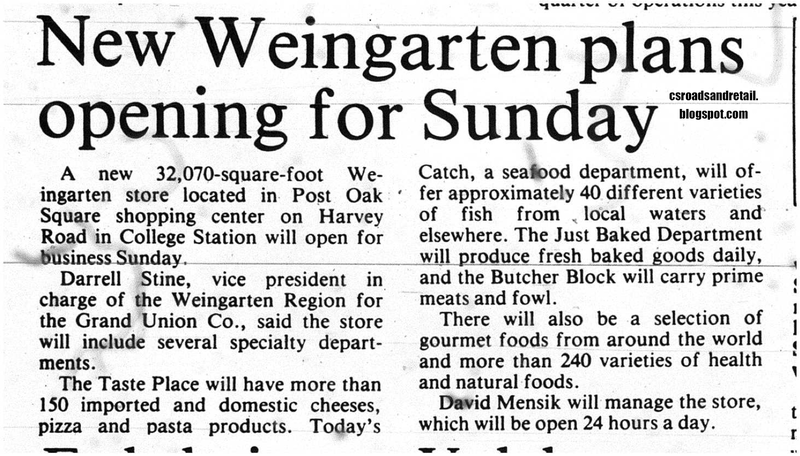 It then became another name when Weingarten's sold out on the verge of bankruptcy. I don't know what it is now, I think a Toys-R-Us." 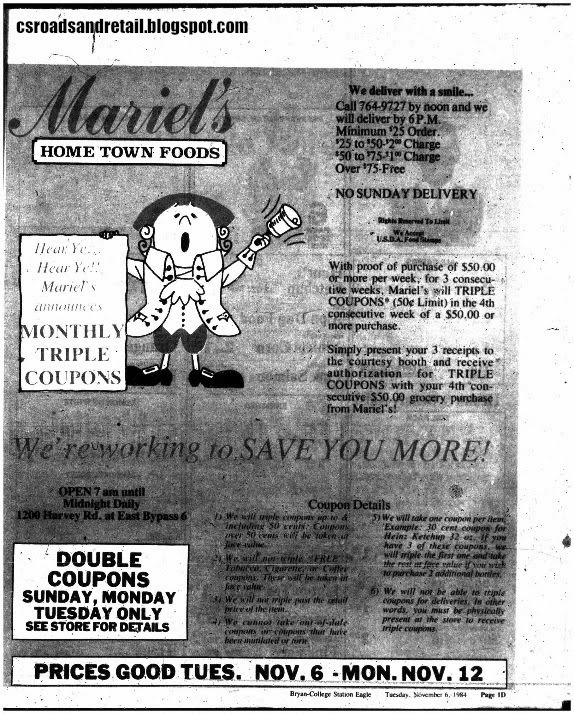 After some discussing on message boards and reading other archived material, I erroneously determined that the intel was false, as others independently remembered a supermarket named Mariel's (or the inaccurate "Muriel's"). 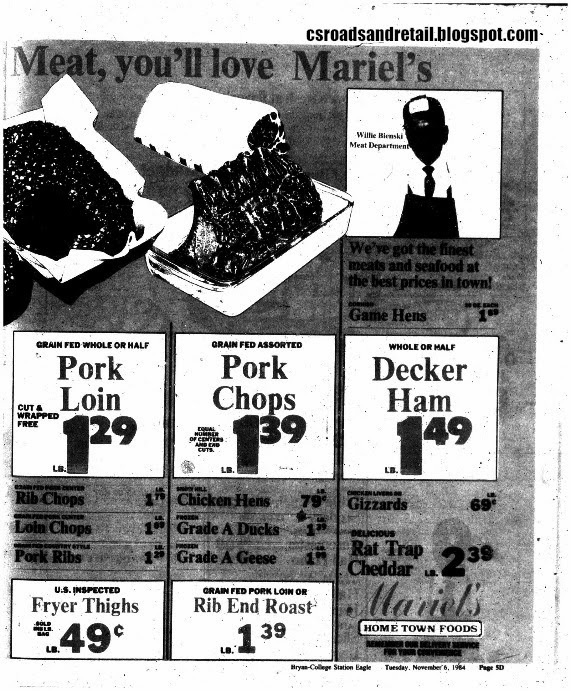 It was indeed Mariel's, which didn't last too long itself (don't know when it took over Weingarten but it lasted until at least November 1984, as that's when the ads found below are from). 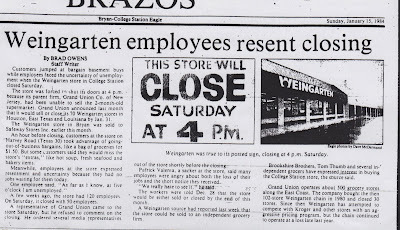 The reason why Weingarten lasted such a short time here (after all, the Weingarten store in Bryan dated back to the mid-1950s) was the fact that by this time, Weingarten had been sold from the original family that owned it (yes, the same real estate company) to another supermarket called Grand Union, which remodeled many stores and built new ones, but decided to pull out just a few years after buying it, and most of the stores were flipped to Safeway. 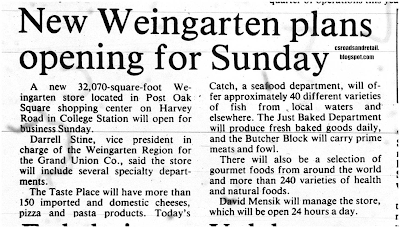 One of the articles here mentions that Safeway took over the other Weingarten in Bryan, but I found nothing else in the January 1984 paper about the exchange (it may have been mentioned somewhere, but I didn't see anything). The reason that Safeway didn't take over this Weingarten was the result of the Safeway at Culpepper Plaza, a store with a comfortable long lease and a great location, and arguably a good thing too...the fact that Safeway bought all these Weingarten stores caused a ripple effect that would end up cutting the Houston division off from the main chain, which was shrinking at the time, to become AppleTree, only for that chain to quickly fail because of all the dated Weingarten stores Safeway picked up. It cut off "The New" part of the logo. Sorry about that. Listed as "Mariel's Fine Foods" in the phone book, "Mariel's Home Town Foods" was now competing head to head on "good quality, low prices" like the other stores in town were (Kroger, Six Star Foods d/b/a Piggly Wiggly, and Safeway). Here's a newspaper ad from Mariel's in '84, which was presumably after its fall from grace. Enjoy. 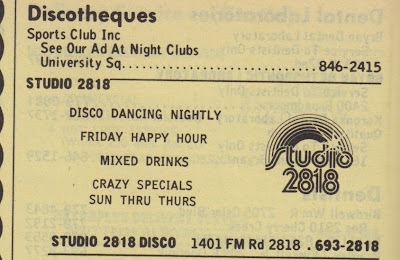 Note that although it wasn't the upscale store it was, it still had a number of perks, including video rental (uncommon at the time, though Skaggs Alpha Beta also did it) and grocery delivery (I don't think any supermarket in town does grocery delivery anymore). Both the College Station Weingarten's and Mariel's are obviously not well remembered, but part of the problem was that there just weren't very many people living on that side of town. Safeway at Culpepper Plaza wasn't very far away and was a slightly larger, more established store in a better location. For what it's worth, Toys R Us isn't part of the shopping center, and not just because its parking lot is different (this may have been because it was built earlier, but I don't know), but I'm going to try to explain the history of the center the best I reasonably can. 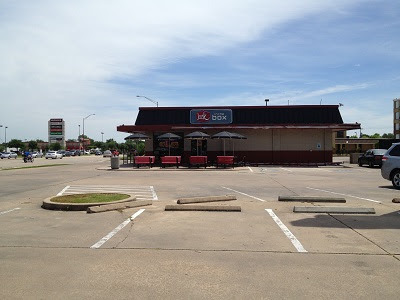 Weingarten, and later Mariel's, was occupied by Hobby Lobby, which moved circa 2003 to its current location at Holleman and Texas Avenue. 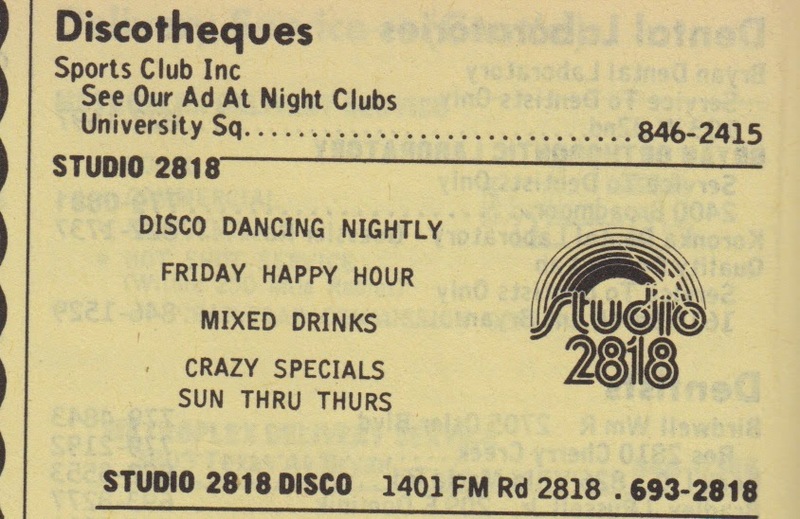 After it left, it was divided into two stores (1200 Harvey and 1210 Harvey), which at the time was a store called "The BOUNCE!" and the 99 Cents Store, which was expanding heavily during that time. The BOUNCE was a bit overlooked. "The BOUNCE! [is a] locally owned and operated 12,500 square foot party facility featuring your favorite inflatable castles, obstacle courses, huge slides, rock climbing walls and more, all in a safe, climate controlled environment. Four private party rooms with a private jump arena are available. Great family fun! Has diner seating with drinks, coffee and snacks plus WiFi access." These things tend hinge their existence on birthday parties, and for whatever reason, it failed within a few years (maybe lasting from 2006 to 2009), and I think that it's the same reason why Putt-Putt and Gattitown declined and ultimately closed. Eventually those two stores became different ones. Burke's Outlet is now the current holder of 1200 and the adjacent 1210 Harvey Road is Tuesday Morning. 1140 - LifeWay Christian Stores - used to be Avenue, a plus-sized women's clothing store. Lifeway opened in spring 2014. It may have absorbed two smaller stores. 1128 - TJMaxx - T.J. Maxx has been there for years, and always had some budget educational software for the Mac on sale (for some reason, CD-based computer software was a big thing in the 1990s, every store had them). 1120 - vacant - Bea's Bridal most recently but it seems to have closed a few years. 1108 - Q Beauty - In 1998 and 2001, this was Treasures Gift Shop. 1106 - Citifinancial - Currently I have no history on this. The tenant used to be shared with Weight Watchers (which moved in March 2015), and Weight Watchers used to be 1104-D. 1104-D turns up "Kristin Dungan", which appeared to be a photography-related store. 1104A - Plato's Closet - This opened around 2009. 1102 - Wolfies - Ninfa's opened in the mid-1990s (January 1995, according to InSite Magazine; the space was formerly Imperial Chinese Restaurant, unrelated to the one on the bypass) before it moved and eventually became Wolfies. It was vacant for several years. 1402 - Mattress SleepCenters - Formerly Pier 1 Imports until the early 2000s when it moved to Texas Avenue Crossing at Texas Avenue and George Bush. 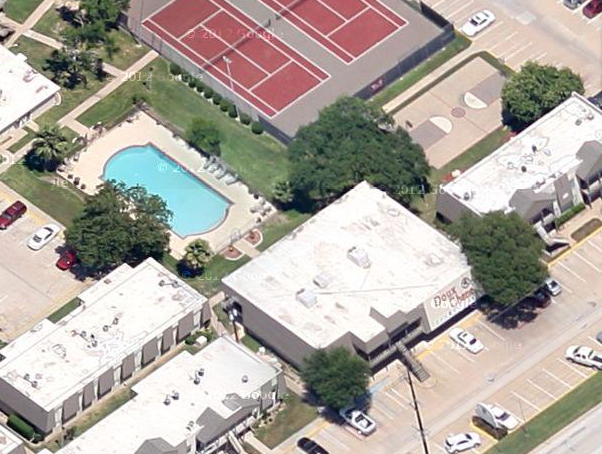 1400 - demolished - Former Cavender's Boot City, moved out around 2006 and NEVER retenanted (it's the blank spot behind Mattress SleepCenters, and nearly impossible to see). 1100 is a strip in front of Wolfies with four tenants - Al's Formal Wear, Edward Jones, Merge Boutique, and Merle Norman. Papa John's was located here for a number of years, then closed (not moved) and was vacant for a number of years. I think it was Suite D (Merle Norman). Finally, there's one more story to tell, and one I unfortunately got wrong for at least a year, the Grandy's. 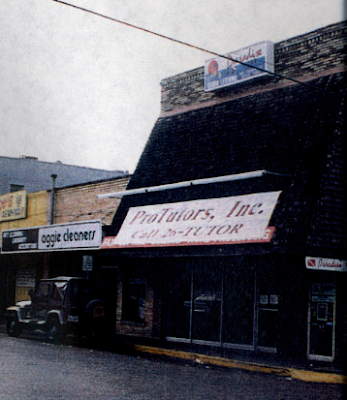 Located at 1002 Harvey Road, the Grandy's was likely next to Mattress SleepCenters and was where the parking lot is today (if I had a mid-1980s aerial, I could prove this). 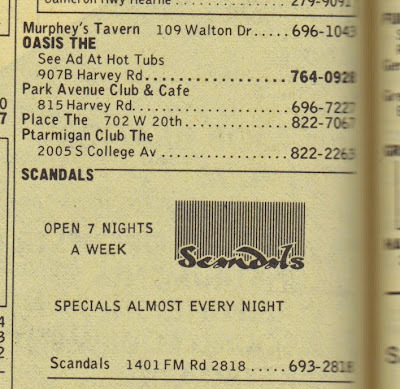 I think Grandy's probably closed in the early 1990s, based on my phone books. 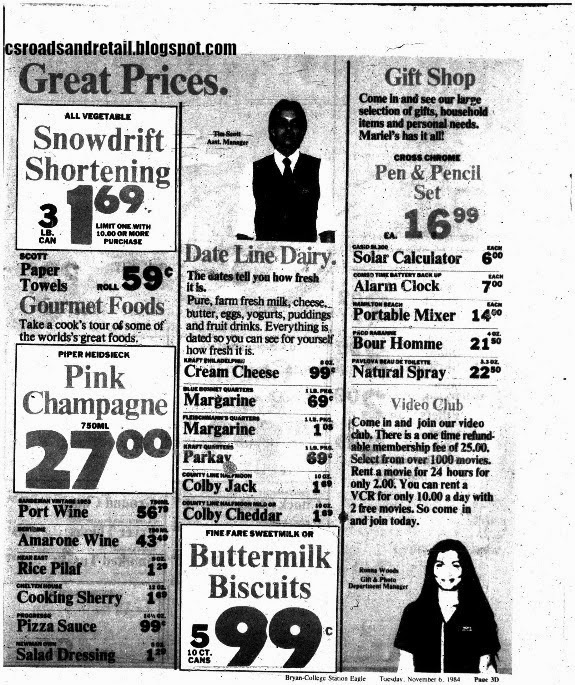 To note, I had read a classified ad in the microfilms that they were looking for older women to be waitresses. Grandy's isn't found south of Dallas anymore (except Victoria). 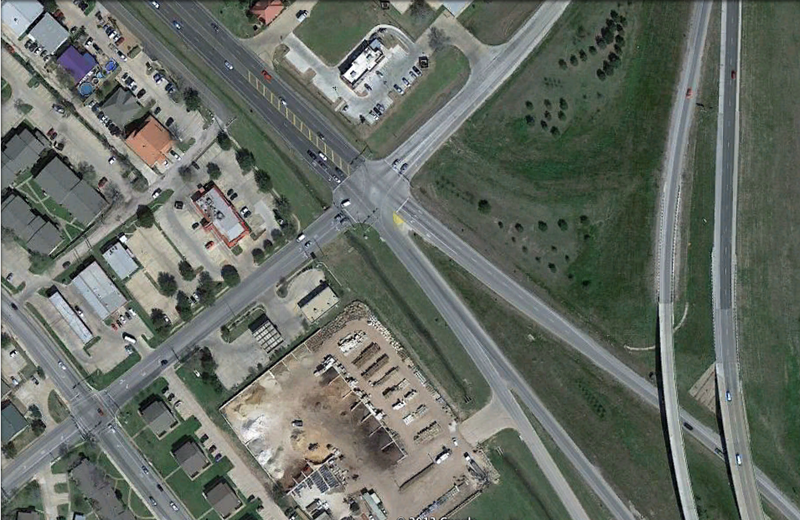 I believe the closest one is in Italy, Texas, where it shares the building with a gas station, McDonald's, and motel.